Our Decibel Defense safety ear muffs are the QUIETEST & MOST COMFORTABLE noise reducing earmuffs you have ever owned, or your MONEY BACK! That's our "Double-D Guarantee”. Now, no safety earmuff can eliminate all sound, but with a Noise Reduction Rating (NRR) that tests as high as 37 decibels (dB), our foldable ear muffs reduce more sound than any other safety ear muff on the market. 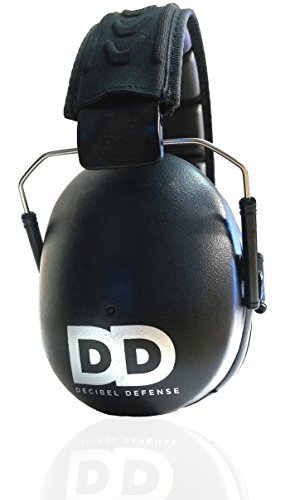 Whether you need ear protection for the firing range, construction work, machinist tools or just personal quiet time around the house, Decibel Defense is the top rated hearing protection earmuffs. And our smooth, padded cell headband with fabric stitching is the pinnacle of long lasting comfort and durability. Best of all, our customer service will not be beat! From our follow up, to our discounts, we value and appreciate you choosing our American family business, and we work hard everyday to make sure that you have the best experience possible. BEST SAFETY EAR MUFFS AVAILABLE: Decibel Defense is the perfect ear protection for shooting. Easily foldable, it's compact design makes it ideal for the gun bag. Can be worn at the gun range with shooting glasses. One of the essential shooting accessories, Decibel Defense noise protection is unbeaten for it's sound reduction ability with 9mm ammo, the glock 19, power tools and mowing the lawn. Safe and comfortable for adults, kids and toddlers alike. AS YOU FEEL THE STURDY CONSTRUCTION OF OUR PROFESSIONAL EAR PROTECTION: From our smooth, padded cell headband with fabric stitching, to our industry leading 37 dB NRR, you will hear and feel why Decibel Defense are the QUIETEST & MOST COMFORTABLE hearing protection you have ever owned, or your MONEY BACK! That's our "Double-D Guarantee". WE ARE COMMITTED TO EXCELLENCE: So long after you have unwrapped our beautifully custom designed packaging, if you ever have any problems at all, just reach out to us and we will make things right, FAST! ANSI S3.19 & CE EN 352-1 Certified Ear Protection tests at an NRR of 37 Decibels! Reducing noise 34-37 Decibels (OSHA rating of NRR 34dB, as OSHA automatically subtracts 3dB for their approval rating, considered like an additional 3dB "safety net" for the consumer). Perfect for: Shooting Range - Personal Quiet Time - Machinist Tools - Construction Work - Lawn Maintenance - Mowing - Study - Concerts - Sporting Events - Drummers - NASCAR - Monster Truck - Fireworks AND MORE! If you have any questions about this product by DECIBEL DEFENSE, contact us by completing and submitting the form below. If you are looking for a specif part number, please include it with your message.